Eileen Spinelli is a poet and picture book author with a talent for lovable stories that tug at the heart. She is the author of more than forty books for children, including Heat Wave, When You Are Happy, I Know It’s Autumn, Thanksgiving at the Tappletons’, Sophie’s Masterpiece, and Somebody Loves You, Mr. Hatch. Ms. Spinelli lives in Wayne, Pennsylvania. Counting Blessings by Eileen Spinelli is adorable! My three year old loves reading this book to help her remember how to count to 10. She's almost got it but forgets 7 and 8. We've been reading this book every night together and just this morning she was able to count to 10 all on her own and remembered 7 and 8. She loves the illustrations throughout this book and I love that it helps her see the blessing in her life. This board book is absolutely perfect for little ones and a wonderful way to learn to count to 10! 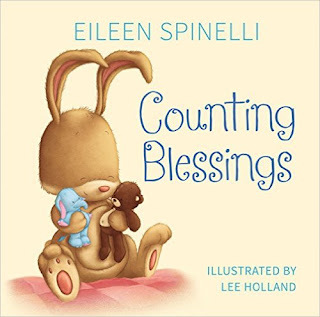 You can find Counting Blessings by Eileen Spinelli on Amazon, Barnes and Noble and other bookstores.